Information on how to submit an abstract for a paper presentation at the conference. The second conference will take place between May 16th-18th 2019 and it is titled "Scandinavian Languages and Literatures World Wide – Prospects and Challenges". The Centre for Scandinavian Studies Copenhagen-Lund (CSS) was established in 2010 and has, among other things, conducted a project dealing with the instruction of neighboring languages and the internationalisation of the contiguous local Øresund region. The objective of CSS is to promote the collaboration between Scandinavian or Nordic-oriented institutions the world over and initiate cross-national research projects in Scandinavian studies. To that end, CSS organized the conference in June, 2017 entitled Rethinking Scandinavia. Similarly, in May, 2018, CSS initiated the research project Nordic World Literature in which researchers from various countries will examine the spread and impact of Nordic literature around the world. Scandinavian languages and literatures present a wide array of perspectives. Though they exist first and foremost in Scandinavia, they are not studied solely in Scandinavia (or in the Nordic Countries) but in many other places in the world. What linguistic choices are made in the literature? What sort of linguistic impact does the literature have? Translations are of special interest to researchers when seen from various perspectives because being able to transform a text, regardless of whether it is fiction or non-fiction, and not just from one language to another but from one culture to another, is a constant challenge. These exciting questions in terms of prospects and challenges may, of course, also be found in other areas of research, as for example, sociology of literature, sociology of language, discourse analysis, mediatization and intermediality. What status will Scandinavian languages have in the multi-ethnic and globalised world of the future? How does a transformed world affect things like language policy, views on language and the mutual intelligibility between the Scandinavian languages in the future? What impact will immigration have on the population composition and languages of the Scandinavain countries? And how should linguistic integration be dealt with and implemented? How are the Scandinavian languages currently being taught around the world? Are there places in the world that tend to emphasize certain aspects, such as those pertaining to language communication, structural linguistics, or those that are of a literary, societal or philological nature? Can we benefit from learning about the didactical methods used in other parts of the world in order to improve and enhance the efficiency of our own methods when teaching Scandinavian languages as foregn languages? What challenges are the minority languages of the North currently facing? Should minority languages grow, be redefined and should they be renegotiated as the local communities in Scandinavia become increasinlgy multicultural? Will the increase in immmigration have an effect on these questions, regionally, globally, politically, in relation to the media or in terms of the history of mentalities or in terms of literature? Conversely, as minority languages, what challenges do Nordic languages face in various parts of the world? For example, what is the situation today for Swedish in Finland, Danish in Greendland and Iceland, etc? Are the tendencies the same or do they differ? Which Scandinavian authors have been translated to and published in various languages and parts of the world, not only currently but in recent centuries? What literary tendencies, genres and components are considered to be typically Nordic in various cultures and to what extent do these distinctive components affect translations in terms of, for example, marketing, critical reception, sales and the overall impact that those translated works have? How have networks amongst authors, translators, critics, agents, publishers, book sellers, cultural institutions and other players in the publishing world contributed to the promotion of Nordic literature in the rest of the world through the centuries? What specific problems do translators face? In the last two centuries Scandinavian literature has played a significant role in conveying notions of Nordic identity and mentality to the rest of the world. What does Scandinavian literature stand for today when seen from various international perspectives and which authors and tendencies have been taken into account by various regions throughout history? Which Scandinavian works have, temporarily or permanently, managed to achieve canonical status in various contexts? What can be said about the spread of Scandinavian literature when seen from a broader intermedial perspective? Scandinavian children's literature has for a long time achieved ongoing success worldwide and in many locations in the world is considered the gold standard in relation to questions that are of a moral, didactic and literary nature. How do the conditions for this spread of Scandinavian children's literature differ from those corresponding to adult literature? Which authorships and genres within Scandinavian children's literature have been of particular importance in various parts of the world and how do these patterns correlate with the broader context of children's culture, now and in the past? The construction of that which is Nordic and the North has had, with its altering implications and its vast scope, considerable political significance during the last two centuries, especially within the Anglo-American, German, and French cultural spheres and also comprises an important prerequisite for the international emergence and spreading of Scandinavian Studies as an academic discipline with its significantly varying conditions and limitations in different parts of the world. In what overall international context have the notions of the Nordic taken shape and proven helpful and how are those processes reflected in pertinent details? To what extent have academic Scandinavian Studies worldwide been molded in relation to the notion of the Nordic? Language and literary Scandinavianists comprise a majority of the international Scandinavian Studies community of teachers and researchers, both within and outside the Nordic countries, and education and research within both fields have been historically tied to one another. Where is research being conducted that unites as opposed to divides studies within language and literature in current international Scandinavian Studies and what interdisciplinary models and ideas are being applied to bridge in a productive manner the divisions that are methodical and epistemological in nature? 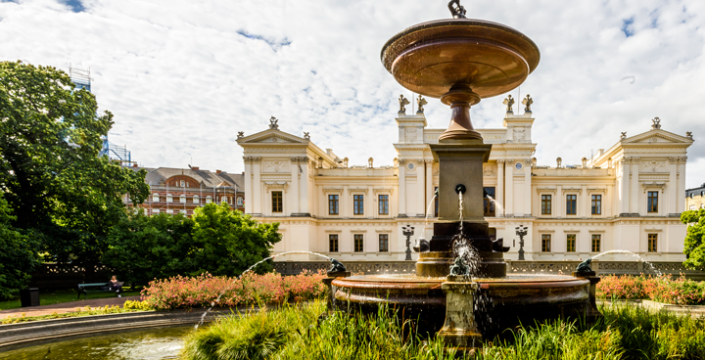 Education and research in Scandinavian Studies is continually in progress at approximately 250 academic centres of learning in the world, as well as in a variety of other kinds of education on different levels within the field. This global community of studies in Nordic languages, literatures and cultures is an important object of attention both in Nordic foreign, educational and cultural policy, and of corresponding ambitions in the countries in which the studies are conducted. What significance have the endeavours of Scandinavian studies in the world? What do its general prospects, challenges and future look like? The fee for the conference is 1000 SEK (around 100 EUR) [including 25% VAT]. This includes lunch and refreshments on Friday and Saturday. There will also be a conference dinner on Friday evening that will cost an extra 600 SEK for those who want to participate. We prefer that you pay in advance and with a credit card, as we don´t have any means to handle cash payments. You can pay online by using this site: https://luccp.adm.lu.se/. Deadline for payment is the first day of the conference, May 16. Under “Event”, choose “CSS Conference 2019”. Under “Remittance information”, either put “fee+dinner” if you paid for dinner as well (all in all 1600 SEK) or just “fee” if you only paid for the conference (1000 SEK). If you have any allergies or food preferences, please let us know by mail. 221 00 Lund (see map below). We will be in both the LUX building and the SOL building, the details will be provided in the coming programme. Information about schedule, keynote speakers etc will follow, so keep an eye on this site. OBS: Due to some insightful comments and further considerations I have made some important changes in the Schedule as of April 16th. More, hopefully just minor, changes may come. Please keep an eye on website for updates. Especially notice the new starting time on Thursday: 12:00! Each presentation is estimated to take 20 minutes and every session contains 4 or less presentations. On the schedule i have left room for 20 minutes of discussion at the end of a session, instead of shorter in between. This can of course be modified to the liking of the participants in the session. After each session there is also a break for 20 minutes. Hopefully this strategy will allow for a intense, yet flexible flow of presentations and discussions. Some of you may find that your presentation have been put under another topic than the one you chose when submitting your abstract. This is because I have tried to put together sessions with papers that relate to each other as well as to the topic in the session title. If anybody feel that they have been mistreated by this, please let me know! Some of the topic titles has also been slightly changed or added to, to be able to better represent the contents of the sessions. A final schedule will follow, including short presentations of the speakers and their abstracts. I’m sorry for the delay, it was harder to put together than I thought!